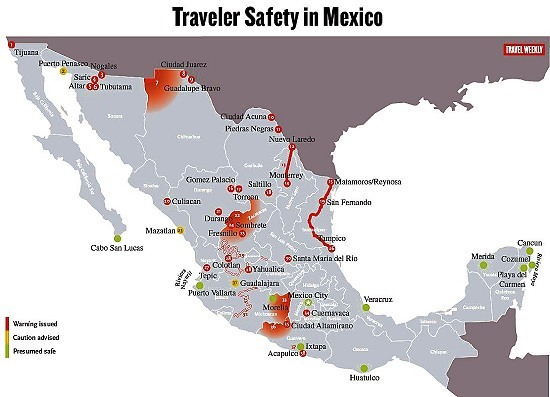 I personally think that Mexico is a great danger to travel to . Even though many people that i know say it safe but to one conclusion How do we now that we’r going to making it through, if when passing the border of Mexico is where there is more danger of people being killed ??? And so many things that the ”News” say now days. I personally think that no matter where you are in the world some type of precaution must be taken. Why does the US gov’t does not issue travel warnings to Chicago ILL, where an average of 10 people are murdered each day; or New Orleans where travel agencies strongly advice against traveling outside the French Quarter due to high criminal activities; or Philadelphia which has the newly acquired nickname of “Killadelphia” where an average of 5 murders occur each day.